San Francisco 49er superstar quarterback Colin Kaepernick roiled the racist establishment when he “took a knee” rather than stand and salute the American flag during the playing of the National Anthem on Aug. 26 before the 49ers final pre-season game against the San Diego Chargers. This was the fourth time, but the first in uniform during this year’s pre-season games, that Kaepernick, who led the 49ers to the Super Bowl in the 2012 season and to the N.F.C. championship game in 2013, refused to stand. After recovering from several injuries and three surgeries since 2014, Kaepernick will likely be the 49ers’ back-up quarterback as the 2016 season begins. Kaepernick has been pilloried by racist bigots across the country but has also received wide support among 49er fans and social justice activists. He was joined in his refusal to stand by 49er teammate Eric Reid. The following week, Seattle Seahawk cornerback Jeremy Lane, similarly refused to stand during the National Anthem in order to “stand beside” Kaepernick. 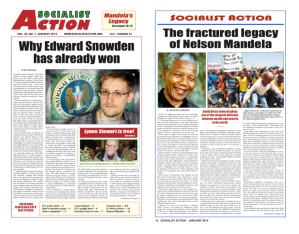 Jeff Mackler is Socialist Action’s candidate for U.S. president in 2016.